The graph below shows global warming for a 30-year period centered on January 2018, using NASA 2003 to January 2018 LOTI anomalies from 1951-1980, adjusted by 0.59°C to cater for the rise from preindustrial to 1951-1980, and with a polynomial trend added. Above graph shows that the 1.5°C guardrail, set at the Paris Agreement, was crossed in 2016 and that a 10°C (18°F) warming could eventuate within a decade or so. The variations in above temperature data are strongly influenced by El Niño/La Niña. We currently are in a La Niña period, during which surface temperatures are suppressed, whereas surface temperatures in 2016 were much above the trendline, due to El Niño. 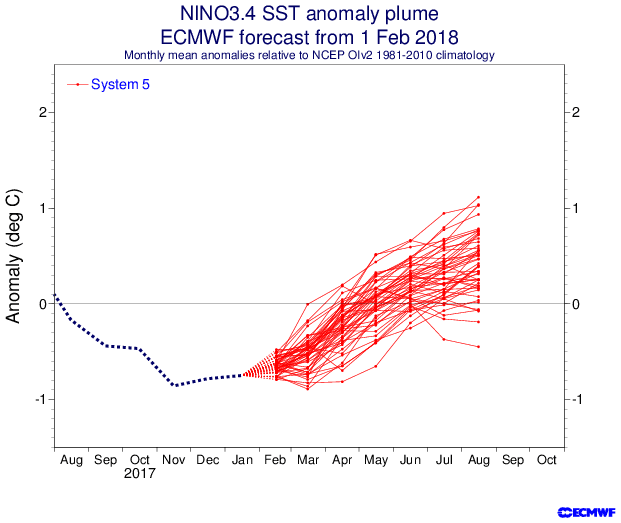 The ECMWF forecast from 1 February 2018 on the right indicates that we're heading for another El Niño, i.e. surface temperatures will be rising strongly over the coming months. The IPCC seeks to downplay the amount of global warming that has already occurred and that looks set to eventuate over the next decade or so. A leaked draft of the IPCC 'Special Report on 1.5°C above pre-industrial' (First Order Draft of SR1.5 SPM) estimates that the global mean temperature reached approximately 1°C above pre-industrial levels around 2017/2018. The IPCC appears to have arrived at this estimate using an extrapolation or near term predictions of future warming so that the level of anthropogenic warming is reported for a 30 year period centered on today. This 1°C IPCC estimate looks quite incredible when calculating the temperature rise using NASA's data for the two most recent years for which data are available (2016/2017), which shows a warming of 0.95°C when using a baseline of 1951-1980 and a warming of 1.23°C when using a baseline of 1890-1910. Indeed, the temperature rise differs depending on which baseline is used, and when using preindustrial as a baseline, i.e. the baseline agreed to at the Paris Agreement, indications are that temperatures have already risen by more than 1.5°C, as also discussed in an earlier post. 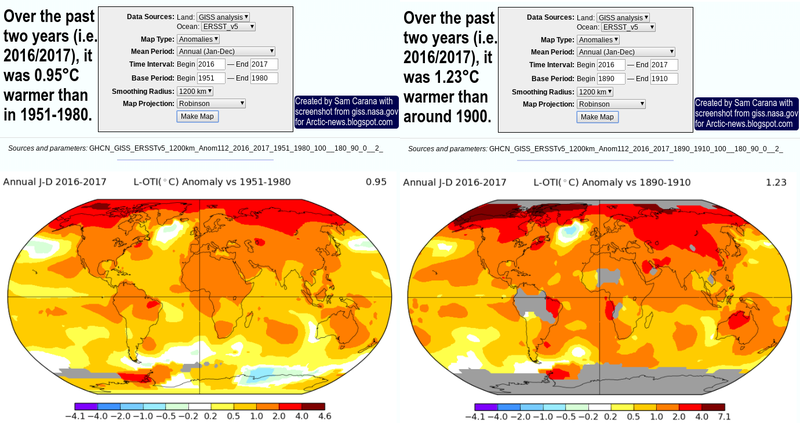 Furthermore, when using a 30-year period centered on January 2018, the current temperature will have to be calculated over the past 15 years and estimated for the next 15 years, i.e. up to the year 2033. To arrive at a 1°C rise for the 30-year period, the IPCC must somehow assume that temperatures will magically fall dramatically over the next 15 years, whereas indications are that temperatures will instead rise dramatically over the next decade or so. The image on the right shows that 10°C (18°F) warming from preindustrial could eventuate within one decade when taking into full account the warming that could result from the elements depicted in the stacked bar. Each of these warming elements is discussed in more detail at the extinction page. The image below shows the rise from 1750 to 2030, in surface temperatures (land+ocean), rather than in anomalies. Thanks for keeping it real. I have been frustrated with the baseline issue for some time and I still can't understand the reason for the change. I don't mean the stated reason but the real one. I suspect the change in baseline creates the impression that we have time to deal with this issue. I think the IPCC realizes our time is up, we no longer have enough time to change the inevitable, especially when counties are doing relatively little to address the gravity of the situation. Didn't El-Nino use to come once in 5-10 years with super El-Ninos once in 15 years? 3 years gap... that's alarming. 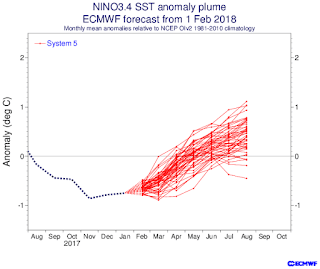 if this El-Nino will be a major one, which wouldn't surprise me, and will hit us before August, I think we are going to be missing food as early as the end of the year, with crops failing all over the green belt. Why is no one concerned about the seriousness of global warming when one of the most common fears among all normal human beings is extinction or the fear of death. Something is wrong with the messaging. People just don’t get it, period. Imagine telling everyone that the human race is on its last legs and the majority of our species will be dead before the end of 2026 …that’s eight years! Imagining the human race gone is very unsettling. Yet, our history is rife with stories of the end of the world, and we’re still here. Too many false alarms has clearly numbed people to the idea of the fear of fears, human extinction. Well, let’s hope our sense of immortality and the afterlife becomes our new reality, otherwise, lights out.